These tiers are based on a player's overall rating. The specific rating ranges for these tiers will be revealed soon. 1. Day One theme – The attribute ratings on these cards won't ever change, as they will be based on the initial roster that ships with NBA 2K16. 2. Green theme – The attribute ratings on these cards will automatically change based on the game's regular roster updates. You will receive three of these cards just for preordering NBA 2K16. 3. Special Moment theme – Whenever current NBA players produce buzzworthy moments in the upcoming season, Visual Concepts will create special edition cards featuring boosted attribute ratings. So if Kyrie Irving scores 50 points in a game again next year, he could get a Special Moment card with increased shooting and scoring attributes. You will be able to sell these cards on the auction house. Ronnie and Chris also hinted that these cards might be used as locker codes, or might possibly be in-game rewards that you have to earn/unlock. 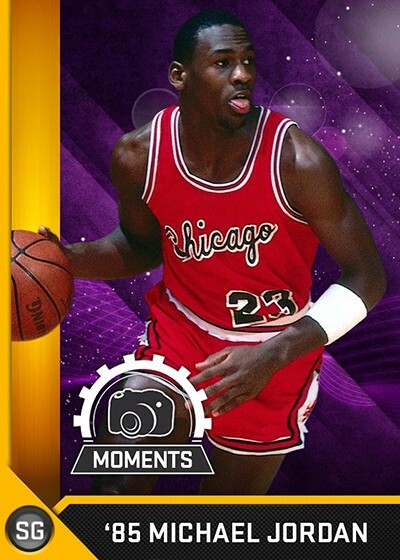 You'll receive the "Special Moment" Michael Jordan card (pictured at the top of this post) for pre-ordering the Michael Jordan Edition of NBA 2K16. The card will have attribute ratings based off MJ's first career NBA game. According to 2K Sports, Pink Diamond cards will not be available for NBA 2K16, though locker codes will still exist in some form. No specific changes or improvements were mentioned regarding the auction house.